Social Commerce on Product Pages - Why Not? Home Ecommerce Platform Social Commerce on Product Pages - Why Not? Social Commerce on Product Pages – Why Not? 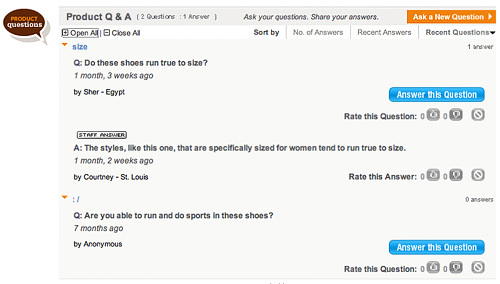 Shoes.com enables customers to ask and answer each others’ questions right on product pages using the Ask & Answer tool from Bazaarvoice. Considering the popularity of both online forums and product reviews, it makes sense that customers ask and answer questions of each other about a product right on the product page. Shoes.com provides Q&A for every product it carries. 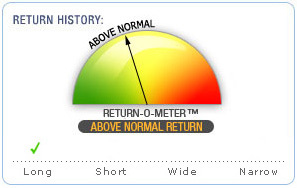 Another shoe site, Shoeline.com has a feedback mechanism called the Return-O-Meter, so prospective buyers can see why people returned an item – it fit short, it fit long etc. But Shoes.com’s approach covers the “long tail” of questions in consumers’ minds – and gives them an outlet to resolve them. The concern with this type of user-generated product information is what you typically see on blogs and forums – spam comments, comments that are not useful, inflammatory comments about other members and so on. So proceed with caution, and make sure you have a dedicated team member moderating the conversation. Another caveat is if nobody answers customers’ questions, or the answers are not helpful. Shoes.com has its representatives provide input (indicated with a badge) for most questions. Unfortunately I found several questions while surfing the site that have gone unanswered in over a month. The big challenge is to get people taking the time to contribute. To encourage repeat participation, Shoes.com could implement a system reward top contributors with gift certificates or a chance at a prize draw, for example. What do you think are the pros and cons of having social questions and answers?